Demonstating that God has not decided to sin His Son because Adam sinned. Is God in the know about salvation? glasseyedave	. God's plan A or B	. Adam, Arminianism, Bride, Calvin, Calvinism, Did God know Adam would sin?, Did God know man would sin?, Fall of Adam, Fall of man, Grace, imputed righteousness, Lamb that was slain, mystery of God, New Testament, Old Testament, predistination, promises, repent, Repentance, revelation, rightouseness, sin, The gospel according to the gospel, The Gospel the church refuses to believe, The hope of salvation, What is the mystery of God, When did Christ die?, Why did God create man? A question has been raised on another blog that I find an interesting question. But more interesting is the answers and dialogue put forth. Simply because I see a question that many people ask, but their answers are so different than what I see in scripture. So I will give my response to the question, “If God is Omniscient, Why Did He Create the World Knowing it Would Fall into Sin?” Please go and compare answers to this question and make up your own mind which is more scriptural. I see more than one question being asked here. One question is, did God know that man would fall into sin before He created him? The second question is, if he knew that man was going to sin, why did he make him anyway? Anyhow this is how I see this conversation. Well did God know that man would fall into sin before He created them? We know that He did, not because of an orthodox position as the source of our confidence, rather it is because it is part of our gospel. Our gospel does not teach that Christ died around 33 AD. 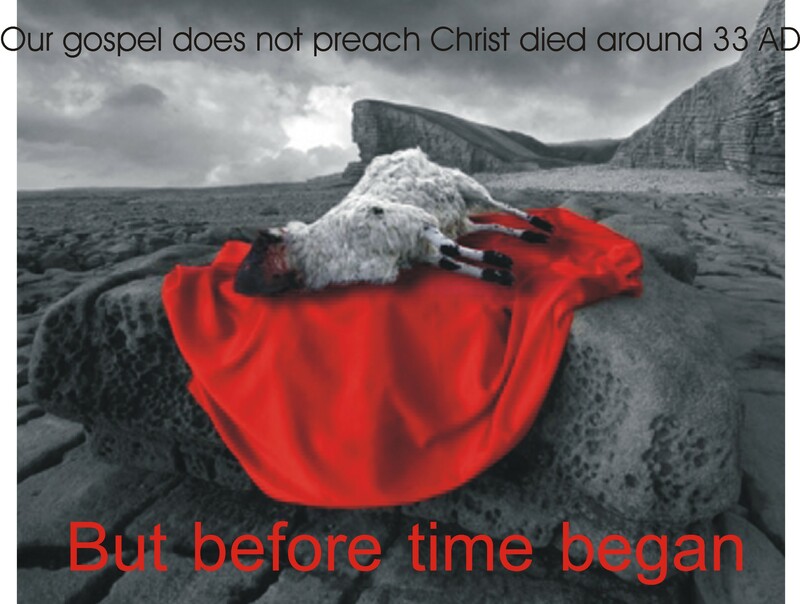 Our gospel teaches us that Christ died before the foundation of the world. Paul teaches us that we had the hope of salvation promised to mankind before mankind was ever created. Even names are written in the book of life before the foundation of the world. Names of people who do not exist. Sounds kind of detailed for God if He is not omniscient. We are all familiar with other scripture that speaks of how God changes not. These are all testimony to our gospel. Our gospel is not that God knew that man would sin. Our gospel is that God provided for a sinful man before he was even created, so that sinful man would have a hope of salvation. This ties directly into the other question. Why would God create man knowing He was going to sin? God has done something for sinful man before sinful man was ever created. As Paul says this act of God’s love towards us is a promise of salvation before the world began. Paul tells us that God created us that we would do more than seek him, but reach out to Him and find Him. But this not the end game to the question why? Rather it is the means to the reason why. By God providing for us before the foundation of the world and His planting us here on the earth to reach out to Him and find Him. It achieves the purpose of why God created man knowing that he would fall into sin. God started all this because it pleases Him to show the incomparable riches of His grace and kindness to us in Christ who are a fallen creature. Bottom line, this is why scripture says Christ endured the cross because of the joy set before Him, because He desires to demonstrate His grace and love to us. To me the question isn’t a tricky one to answer, for God’s word is clear about His understanding, His work, His provision, His motivation and why we should worship such a loving God. I personally do not agree that God’s whole purpose of creation was to manifest His glory. I see it rather as a manifestation of His love expressed in His grace. Just because His glory is manifest in His creation, doesn’t mean it was the purpose. To me it is like saying the purpose of the race car is to magnify those companies who sponsor the car. The purpose is not is what we easily see, but what is revealed in the mystery of our gospel. This being God expressing His love to a sinful mankind through His grace. Am I out in left field on this one Carl? Well WoundedEgo, am I? As one who does not know everything and does not have the education you have, it seems as if you two are arguing all around the topic but not discussing the topic.